Suitable for cutting BOPP tape, PVC insulation tape, foam tape, masking tape, double sided tape, kraft paper tape, duct tape, industrial tape, protection film, etc. 1. Main driving part Siemens AC motor with inverter is employed. Programmable central control is used and 20 sizes can be set on the same shaft for auto transfer and cutting. All functions are operated on the 10" LCD touch panel. The central control system is PLC programmable controller. Cutting positioning is controlled by Mitsubishi servo motor. The imported high precision ball screw is applied to set the size and the linear slide rail is to bear the load of the cutter seat. 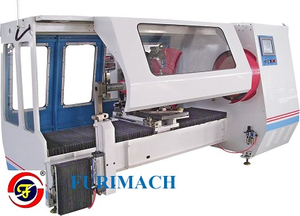 Blade feeding is controlled by Mitsubishi servo motor, and the cutting speed is adjustable in three stages. Mitsubishi servo motor is used to calculate the circular blade angle and the angle change is subject to different materials (the angle change range is ±8°). Three kinds of shafts are available and quick change of shafts is applied for different materials. 1. Other size cutting shaft It can be made as per the required core I.D. 2. Cutting supporter For supporting log roll when cutting core below 38mm. It can keep the blade sharp for easy operation. 4. 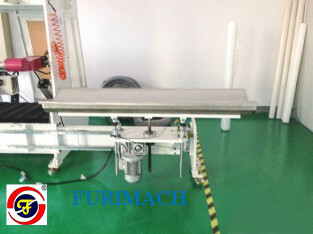 Safety cover To protect operator during the production this is compliant to the CE regulation.